| Button down shirts and I have a checkered past. Aside from the fact that I have had numerous shirts that have annoying fit issues (too tight across the shoulders or upper arms, gaping of the buttons, too boxy, too thick), they always meant one thing stylistically: work. So as the “menswear as womenswear” trend has become much more than a trend and button front shirts are now the new norm, I needed to jump on the casual button down bandwagon. But it’s as if I viewed the button front women’s shirt as having an identity crisis. Was it too stuffy for brunch? If I wear it with a skirt, is that too much? Do joggers look ridiculous? Believe me, I struggled. 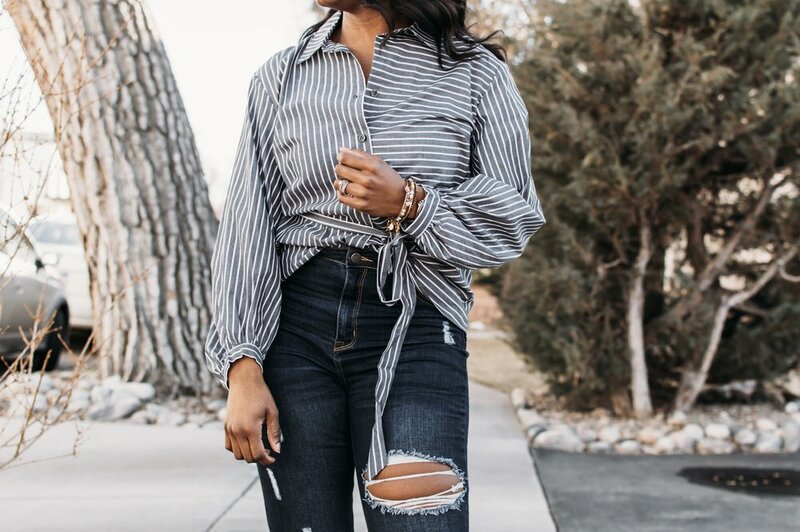 I just could not understand exactly how the casual button down could make its way into my wardrobe until I recently discovered what I consider the magic secret: a loose fit and waist definer. I came across this tunic while scavenging the badly hit Who What Wear section of my local Target, when I spotted one of my favorite colors and patterns (grey stripes, I love you) and leaped for it. Without trying it on, I headed to the self-check out and added this seemingly simple number to my closet. I knew right then that this tunic was going to be a spring-time staple. 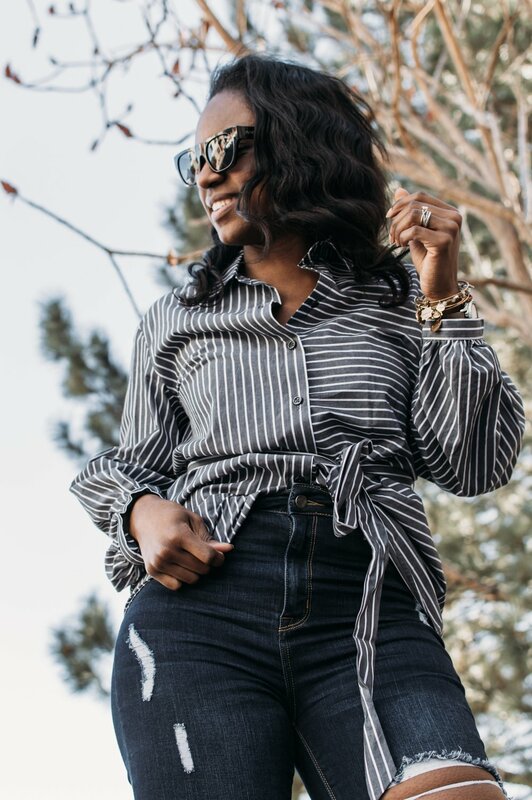 As the weather is warming up and I am in search now of just the right layers to keep me both warm and cool, a long-sleeve button down has all of the answers. Just enough skin coverage to provide that extra protection from a light breeze but thin enough that you can feel the warmth of the sun through the fabric, it’s the perfect compromise. And not to mention the ease, simplicity, and inherent polish of button front blouses. We’ll consider this my first spring purchase of 2019, and I have to admit, I’m am all in for the warmer weather! Dress Loudly. Love Loudly. Live Loudly.